The Best Instagram Marketing blogs from thousands of Social Media and Marketing blogs in our index using search and social metrics. Data will be refreshed once a week. Boston About Blog Sue B. Zimmerman, aka the Instagram Gal, is a master at Instagram for Business. She teaches entrepreneurs, business execs, and marketing professionals how powerful Instagram for business can be. Facebook fans 14,769. Twitter followers 19,773. Facebook fans 577,781. Twitter followers 44,174. Australia About Blog Instagram is a great tool for marketing. However, if you do not know about the ranking algorithm behind it, you may not get the best from it. So here is everything that you need to know, along with tips on how to optimise posts with the algorithm in mind. Facebook fans n/a. Twitter followers 1,570. San Diego, CA About Blog Grow your business with Jumper Media – the leading Instagram Marketing Agency. Outsource your social media marketing to our team of Instagram service experts. Facebook fans 2,236. Twitter followers 636. About Blog Build engaged followers on Instagram by targeting better audiences for your brand. Increase engagement & grow sales with Kickstagram's Instagram Marketing. Facebook fans 184. Twitter followers 1. About Blog Don't buy Instagram followers before you read the reviews! We've tested dozens of the top providers, so you don't have to! Get the BEST and avoid the scams! About Blog Instagram Tips to grow your Instagram account, gain new followers and get more engagement on Instagram with more followers, likes and comments. Facebook fans 2,897. Twitter followers 737. Vancouver, Canada About Blog Fresh Instagram marketing tips, guides, and strategy. All you need to know to drive business results on the popular photo-sharing platform. Facebook fans 693,534. Twitter followers 8,131,005. About Blog Highlighted tutorials and news from Social Media Examiner about instagram. Facebook fans 497,058. Twitter followers 476,578. Chicago, IL, USA About Blog Sprout Social provides marketing professionals with the latest Instagram tips and guides in the social media world. Facebook fans 66,065. Twitter followers 86,164. San Francisco, CA About Blog All things White Hat and Black Hat Instagram. Facebook fans 1,133,149. Twitter followers 497,919. About Blog Read posts about Instagram Marketing on the Ecommerce Marketing Blog - Ecommerce News, Online Store Tips & More by Shopify. Interact with a community of savvy online store owners. Facebook fans 2,594,623. Twitter followers 227,415. Irvine, CA About Blog The latest news, videos, and discussion topics on Instagram Marketing. Facebook fans 3,346,803. Twitter followers 3,177,982. Melbourne, Australia About Blog Looking for ways to engage your users better on Instgram? Or even drive more follower growth? We’ve put together some guides to help individuals & businesses get more from the social network that’s now owned by Facebook. Facebook fans 36,717. Twitter followers 50,817. Vancouver, Canada About Blog Wanting to learn more about Instagram? Check out all our post about Instagram from Later. Facebook fans 7,840. Twitter followers 4,246. Leeds, England About Blog Share actionable digital marketing advice from our community, Dr Dave Chaffey and team of expert commentators. Daily updates and advice on what matters. Facebook fans 60,025. Twitter followers 22,723. Facebook fans 7,617. Twitter followers 6,395. Los Angeles, CA About Blog Grow your small business with Visual Marketing! Expert Design & Social Media Marketing tips for bloggers & businesses just like yours. Facebook fans 2,860. Twitter followers 7,057. About Blog Vibbi helps you grow your following and engagement through organic marketing techniques. Real growth, real people. Cambridge, MA About Blog ThriveHive provides digital marketing solutions for small to medium sized businesses. Let us help bring your business from outdated to updated today! Facebook fans 48,623. Twitter followers 3,206. New Delhi About Blog India’s first digital marketing institute delivering advanced digital marketing course. Facebook fans 170,068. Twitter followers 1,373. Irvine, Orange County, CA, USA About Blog Your social media marketing for business resource to help in your sales, marketing & branding using Instagram, LinkedIn, Facebook, Pinterest, social media conferences and more. Facebook fans 13,498. Twitter followers 46,162. Birmingham & London, England About Blog The Hopper app uses big data to predict when you should fly & buy. Facebook fans 710. Twitter followers 1,372. About Blog Combin is a brainchild of Instagram brands and competent developers that provides easy and safe experience of growing real audience. Find influencers, determine targeted audience and start engaging with their posts right from the tool. Find Tips and tricks, strategy plans, and helpful advices on building involved community around your brand’s Instagram account. Facebook fans 3,275. Twitter followers 12,736. Facebook fans 2,270. Twitter followers 99,095. Sunshine Coast, Queensland About Blog Visual Social Media & Content Strategy for business. Facebook fans 10,117. Twitter followers 46,634. Miami, FL About Blog This is about Instagram Marketing by GAIN. Gain makes the social publishing workflow—including scheduling and client approvals—easy for agencies, social media managers, and anyone working in teams. Facebook fans 651. Twitter followers 2,101. San Diego, CA About Blog My goal is to bring you relevant social media and business trends and discuss their applications, implications, and benefits. I work with small businesses or businesses that are new to social media marketing. Facebook fans 4,395. Twitter followers 13,123. Lahore, Pakistan About Blog SmmPoint is leading social media services company in which providing Followers services. Web designing Web developing Seo Social Media Marketing Also all other services with 100% customer satisfaction guarantee. Facebook fans 1,459. Twitter followers 435. About Blog Read writing about Instagram Marketing in Combin Blog. Tips and tricks, strategy plans, and helpful advices on building involved community around your brand’s Instagram account. Facebook fans 3,224. Twitter followers 12,770. Buffalo, NY About Blog Browse through our Instagram marketing resources. Discover digital success with help from the experts at Mainstreethost! Facebook fans 6,165. Twitter followers 2,162. New Hampshire About Blog Social media is my passion. And my job. I'm here sharing my professional experience working day to day in the trenches of social media, marketing, and blogging. Facebook fans 30,592. Twitter followers 68,992. About Blog Everything you need to increase Instagram traffic and sales. Facebook fans 4,280. Twitter followers n/a. Portland, OR About Blog Molly Marshall Marketing helps small business owners develop effective digital marketing strategies with powerful content marketing and the power of social media. Make the world your oyster! Facebook fans 1,116. Twitter followers 15,855. Facebook fans 953. Twitter followers 1,906. New York, US About Blog Strategic management for your Instagram profile, so you grow with real engagement and targeted followers. Gain more visibility on your Instagram account! Facebook fans 13,227. Twitter followers n/a. Mineola, NY About Blog Fat Guy Media is a Long Island Web Design & Marketing Agency. About Blog IGZY blog consists of highly valuable and informative Instagram marketing blog posts, business strategies, how to grow Instagram business, etc. About Blog Mackayla a Brisbane Instagram Marketing Specialist from Social Stylings will teach you how to grow your Instagram following and convert followers into customers. Read the full blog here! Facebook fans 1,015. Twitter followers n/a. Facebook fans 1,073. Twitter followers 1. Canada About Blog Hey, I'm Aaron 🙂 I make videos to help you create an awesome online business. 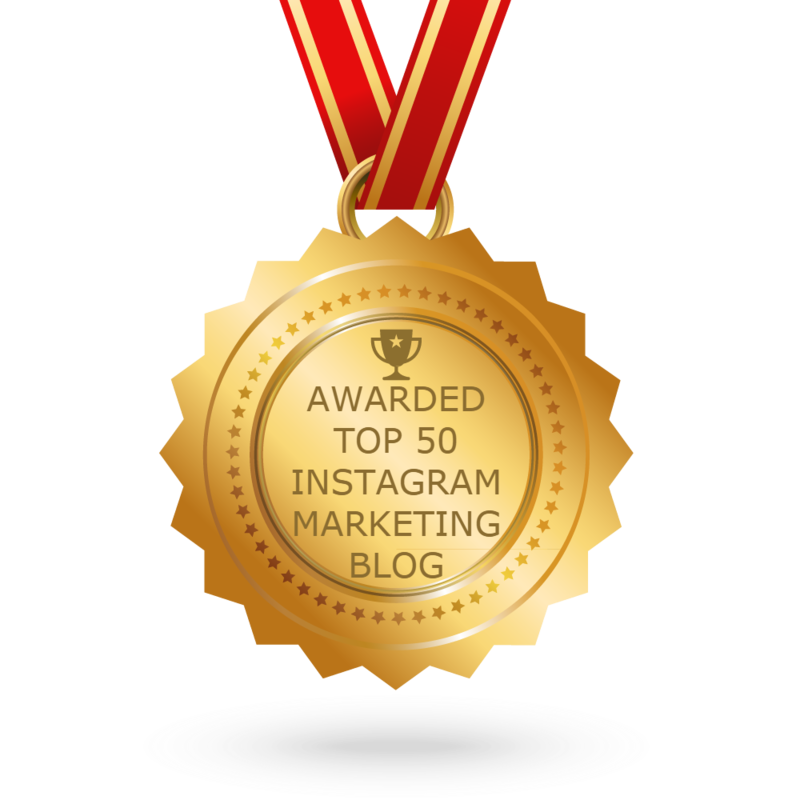 CONGRATULATIONS to every blogger that has made this Top Instagram Marketing Blogs list! This is the most comprehensive list of best Instagram Marketing blogs on the internet and I’m honoured to have you as part of this! I personally give you a high-five and want to thank you for your contribution to this world.